MorningStar has a full line of PWM charge controllers, ranging from their basic 4 amp SunGuard to their brand new top-of-the-line 60 amp TriStar. All of their controllers feature a PWM charging algorithm and battery temperature sensing either built into the unit (SunGuard, SunSaver, SunLight & ProStar) or with an optional sensor (ProStar & TriStar). MorningStar is driven to make their controllers as efficient and reliable as possible while keeping the price competitive with other manufacturers. All of the MorningStar controllers feature a 5-year warranty, and we highly recommend them for small-to-medium-sized photovoltaic systems. 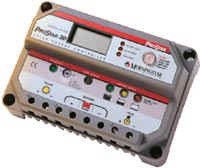 The MorningStar SunGuard is a fully epoxy encapsulated outdoor rated 4.5A "ice cube" sized 12V PWM charge controller. It has built-in temperature compensation, lightning protection and easy 4-wire hookup. The SunGuard's regulation voltage is set at 14.1 (best for sealed or gel batteries) and is not adjustable for battery type like MorningStar's other controllers. It's dimensions are 2.5" x 2.0" x 1.5" and it weighs just 3 oz. The MorningStar SunSaver line of controllers (8 models in all) have built-in temperature compensation, they are epoxy encapsulated, but are not outdoor rated since they have an exposed front mounted 7 position terminal strip. Units are available for 12 or 24V systems ranging in amperage capacity from 6-20 amps. The regulating voltage is adjustable for sealed or flooded batteries by simply removing/installing an included metal jumper between terminals 6 and 7. A green "charging" LED is standard on all SunSaver units while the units with the optional low voltage disconnect (LVD) for a DC load also have a red LED to indicate when the load has been disconnected to prevent the battery from being over discharged. Each terminal can accept up to two #10 AWG wires. It's dimensions are 6" x 2.2" x 1.3" and it weighs 8 oz. The MorningStar SunLight controllers combine the features of the SunSaver controllers (including LVD) with an adjustable automatic lighting control circuit. This allows you to connect a DC light and have it come on at dusk for a set period of time or dusk-to-dawn. It's 10 position rotary switch lets you choose exactly how your DC light will operate. Low voltage disconnect and sunrise override the lighting timer. It even includes a test button so you can turn the lights on during the day or for a short period of time (3 minutes) after LVD has occurred. These versatile controllers are available for 12 or 24V systems with amperage capacities of 10 or 20 amps. It's dimensions are 6.6" x 2.2" x 1.3" and it weighs 9 oz. The second generation MorningStar ProStar line of controllers feature a 3-position battery type selector, tropicalization (conformal coated circuit board and stainless steel fasteners) and the optional display shows protection functions, disconnect conditions and self diagnostics. All units feature built-in battery temperature compensation (an optional sensor is available), low voltage disconnect (LVD) and three LED's indicating your battery's state of charge. The standard ProStar controllers are available with a 15 or 30 amp capacity and will automatically detect your battery voltage to automatically work with 12 or 24V systems without any user adjustment required. Options include a digital display with manual disconnect button, battery temperature sensor and positive ground (on select models). While the first generation ProStar controllers were not the most user friendly, the improvements made in the 2nd generation ProStar line of charge controllers is welcome and makes them a great choice for medium sized photovoltaic systems. The MorningStar TriStar is the newest addition to the family of PWM charge controllers . It is a serious UL listed controller for large 12, 24 or 48 systems and it is available in 45 or 60 amp capacities. Unlike the SunSaver, SunLight & ProStar controllers, the TriStar cannot operate as a charge and load controller at the same time. However, it can be used as a diversion controller for a wind or hydro system where it will dump excess power to a heating element to prevent the batteries from being overcharged. The TriStar is conduit ready with large #2 AWG wire terminals and it will easily mount on existing power panels. It can even be connected directly to a personal computer via an RS-232 port for data logging or remote system monitoring and control. Options include a battery temperature sensor and digital meter that displays battery voltage, charging amperage, battery temperature, cumulative amp-hours and system status in one of 5 languages. While the TriStar is new to the market, MorningStar has spent a lot of time gathering input from their dealers on what features to incorporate into this new controller and we expect great performance and reliability from this unit. Dimensions are 10.3" H x 5" W x 2.8" D and it weighs 3.5 lbs.